Japanese artist Toshihiro Kushizaki has released the Pixel Art Shader: a free Blender shader that should convert any 3D model into old-school pixel art. 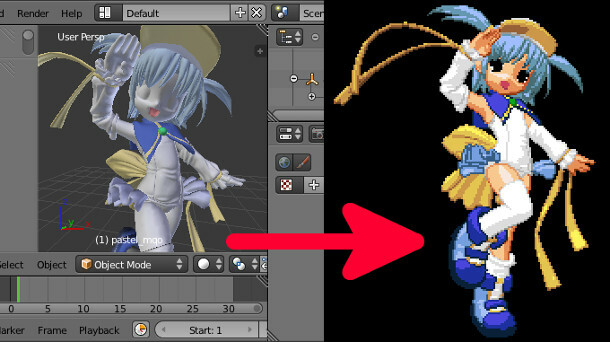 To render out a pixel art image, you just need a 3D model in .x format and a palette texture, which defines the set of colours to be used; but you can augment the result with standard texture maps, even including AO. The image is generated in BMP format, and the results look pretty good, at least in the demo scene. There’s a detailed online manual, but like the rest of Kushizaki’s site, it’s in Japanese, so if you’re a non-Japanese-speaker, you’ll need to navigate Google Translate.